I find it way too easy to let my own nutrition slide during the day when my kids are at school and after the first several weeks of school, it becomes difficult to keep the kids' school lunches interesting. There are only so many non-nut protein sources that my kids will eat and we all run out of ideas to keep lunches interesting! Having healthy meals for dinners that can be used as lunches later in the week makes life so much easier for me, and turkey and lentils are both great sources of protein packed right into this recipe! Did you even realize how much great stuff is in lentils? They're high in protein & fiber and are a great source of minerals like potassium, iron, and folate. Now let's get on to that recipe so you can add it to your weekly recipe arsenal! Cook time: 40 – 50 mins. 2. Add onions and cook over low-medium heat until translucent, 5-7 minutes. 3. Add garlic and continue to cook until garlic is cooked through and softened and onions begin to brown, an additional 5 – 7 minutes. 4. Add ground turkey and season with salt and pepper to taste. 5. Add sausage and stir to break up into bite-sized pieces. 6. Cook until turkey and sausage are cooked through, 10 – 12 minutes. 7. Raise heat to high. Add wine and Worcestershire sauce and cook until liquid is absorbed, 2-4 minutes. 8. Add tomato purée and stir to incorporate. 9. Add water, diced tomatoes and lentils. 10. Bring to a low boil. 11. Reduce heat and bring to a low simmer. 12. Add spices and cook for 5 – 7 minutes until lentils are cooked through. 13. Continue to simmer until ragu has thickened to your liking, up to an additional 10 minutes. 14. Taste and adjust seasoning as needed. 15. Serve over your favourite pasta! 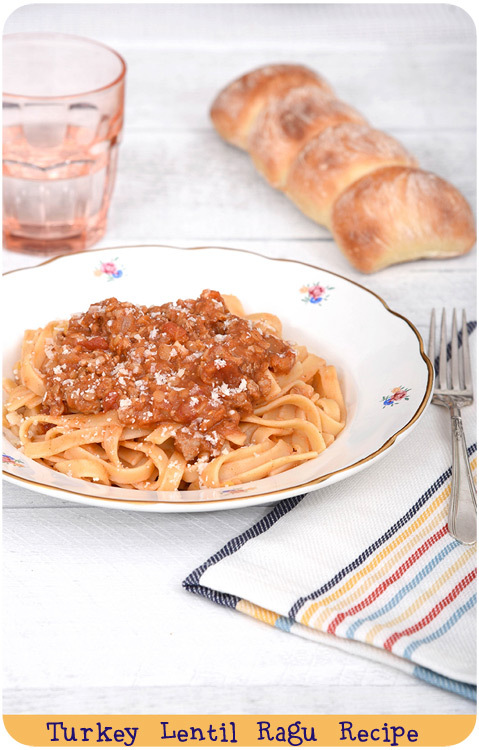 TIP: Serve this hearty, tasty ragu sauce over a bed of spaghetti squash for a healthy alternative to pasta that kids will love! Canadian Turkey and Lentils.org want to help one of you get back-to-school ready with a $75 prepaid Visa gift card! You must be a Canadian resident to win this giveaway. Giveaway will close on September 14th, 2017. There are lots of different ways to enter (or you can enter more than one way). Fill out the form below to enter! Disclosure: This post has been sponsored by Canadian Turkey and Lentils.org, all opinions (as always) are my own. I love turkey. But, I always forget to use worchestiser. SHEESH. HOW DO YOU SPELL THAT?! I think my family would like the Mediterranean Lentil Pasta Salad. I would love to try those breakfast tacos! The Turkey Quesadillas are sure to be a family favorite. My family would like the Pasta with Lentils recipe. With fall coming this Best Ever Turkey Chili recipe would for sure become a family favourite! The Strawberry Cheesecake & Ice Cream Pie. It's healthy right it has lentil! Lentils might be a challenge with my family but I think the Cheddar Smoky Turkey Lentil Burgers would be a success! Yum! Looks like a great recipe that the whole family would love. Thanks for sharing new ways to use lentils as that is one food I am not great about being creative with. The Turkey Tortilla Pie from the Kids recipes will definitely be a family favorite. My family would love the Taco Breakfast. We all love turkey here and the BATCH TURKEY MEATBALLS would be a big hit. No one eats lentils here, I'm the cook! So I'll pick Broccoli, Lentil & Shrimp Sheet Pan Dinner - at least we wouldn't go hungry then eh? Turkey apple meatloaf muffins are sure to be our favourite. BBQ Turkey Burgers would certainly become a favourite around here. No doubt the Cheddar Smoky Turkey Lentil Burgers will be much loved in this household. turkey quesadillas would be a sure hit! Our family would love the Smoked Turkey Wraps! My family would love the lentil recipe of the Broccoli Lentil and shrimp sheet pan dinner. The Turkey Tortilla Pie would be popular with my family. The TURKEY QUESADILLAS are sure to become a family favourite. TURKEY TORTILLA PIE is sure to become a family favorite! Our family would love the Strawberry Cardamom Scones! Our family will really enjoy turkey quesadillas. The Mini Turkey Pizza Meatloaves sound really good. The Lentil Breakfast Tacos sounds good to me. The Turkey Quesadillas would be a sure hit with my family! I know that Beef and Lentil Lasagna with Ricotta and Spinach would be a really big hit with us. Crunchy turkey cutlets for the win! LOVE THE EGG STUFF PIZZA. They'd like the Turkey Quesadillas. The lentil taco salad looks pretty tasty. My family would love the turkey quesadilla! Looks delicious! The Breakfast tacos would be a big hit at my house! I think the Batch Turkey Meatballs would be a big hit in my house, we all love Turkey and we love Meatballs! Fun to dip and an incredible crunch makes for a great kids/family meal so I'd make the Honey Garlic Turkey Tenders with Sweet and Smoky Dipping Sauce! My kiddos love the Piri Piri Grilled Turkey Drummettes. Thanks! I love the recipe for the Breakfast Tacos. My family loves lentils and this looks like a perfect combination of foods! Lentil Chili & Macaroni Skillet would be a nice dinner! My family would enjoy the Best Ever Turkey Chili. The Turkey Quesadillas would be a hit in our house for sure. The Lemony Lentils is a recipe we would enjoy. Breakfast tacos for the weekend. My kids love the smoked turkey wraps! mediterranean lentil pasta salad is our favorite dinner side! The One Pan Thai Turkey Bowls look great! The turkey lasagna with ricotta and basil looks yummy! The PIRI PIRI GRILLED TURKEY DRUMMETTES are sure to become a family favourite. I think my family would love the Smoky Turkey Lentil Chili recipe. The Mediterranean Lentil Pasta Salad. The TURKEY TORTILLA PIE is so good ! For sure my family would love the Mini Pizza Meatloaves! A family favourite from the lentils recipe page would be the Broccoli, Lentil & Shrimp Sheet Pan Dinner. Turkey quesillas would surely be a favourite. Finger food is always popular. Chili Stewed Squash & Chicken must be good because our family loves all of the ingredients. The Mediterranean lentil pasta salad will be a hit with my family. The BBQ turkey burgers are sure to be a hit with my family. The Grilled Turkey Tacos would make a fast, tasty weekday meal. I would like to try the Simple Pasta with Lentils. The Roasted lentil & cauliflower tacos look like a new, fun twist on tacos that my family would find unique and enjoy! Piri Piri Grilled Turkey Drummettes would surely become a big hit. The Mini-Pizza Meatloaves are sure to be a hit around here! I'd love to try the Broccoli, Lentil & Shrimp Sheet Pan Dinner. The Smoked Turkey Wraps would be a favourite in our house. Tortilla pizza melt will be delish! This looks so yummy - I have to try it! The Turkey Quesadillas would be a hit. I think Batch Turkey Meatballs will become a favourite - they are convenient and versatile. I think my family would love Broccoli, Lentil & Shrimp Sheet Pan Dinner. I think the kids would love the Mini Pizza Meatloafs! The Herbed Lentil Skillet with Spinach, Tomatoes, Feta & Egg looks amazing! The smoked turkey wraps sound great! The lentil zucchini lasagna would also be great to try! I sure Love Turkey Wraps! Easy to make and Healthy too! Thanks so much! I think the Cheddar Smoky Turkey Lentil Burgers would be a hit in our house. The Turkey Tortilla Pie would be a hit with my family. The Cheddar Smoky Turkey Lentil Burgers would be perfect for us to try. Mm...mmm...mmm...I'm always looking for new recipes to incorporate turkey into. Thanks for joining last weeks Tasty Tuesday, I can't wait to see what you share this week! This recipe sounds good apart from the lentils, I wonder if it would work just leaving them out.